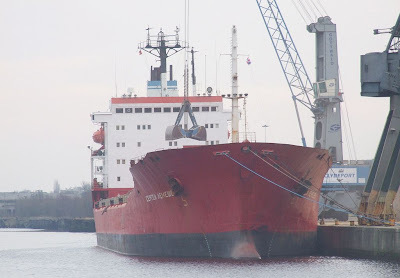 Discharging a cargo of animal feed at Shieldhall riverside berth yesterday, the Russian-flagged bulk carrier SERGEY LEMESHEV was built in 1983 at Varna in Bulgaria. Operated by Novoship, which is the shortened version of her owner's full title, the 'Joint Stock Company "Novorossiysk Shipping Company"', this ship is named after a famous Russian operatic tenor. She is 184.6 metres in length, and has a deadweight of 24,105 tonnes.